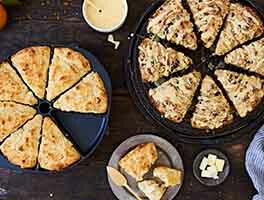 "Everything" bagel lovers will rejoice at this recipe: ethereally light, airy biscuits topped with our distinctive blend of onion, poppy seeds, sesame seeds, garlic, and salt. 10 mins. to 14 mins. In a large bowl, whisk together the flour, topping, sugar, and optional buttermilk powder. Work in the butter just until the mixture is crumbly, with some larger chunks of butter remaining. Add 1/2 cup of milk, mixing until the dough is moistened. Add more milk if needed to moisten any dry bits in the bottom of the bowl. Transfer the dough to a lightly floured work surface, and fold it over on itself three or four times. Pat the dough 3/4" thick. Cut into biscuits with a 2" to 2 1/4" cutter, dipping the cutter into flour between biscuits to reduce sticking. Pile the scraps on top of each other, pat 3/4" thick and cut the remaining biscuits. Place the biscuits on the prepared baking sheet. Brush the tops with the melted butter and sprinkle with the optional topping. 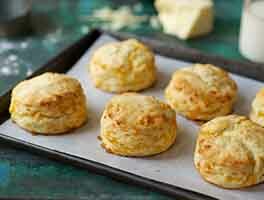 Bake the biscuits for 10 to 14 minutes, or until they're light golden brown. Remove them from the oven and serve warm. 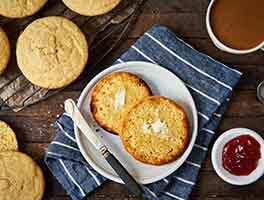 Store any leftover biscuits, well wrapped, at room temperature for two days; freeze for longer storage. Everything Bagel Topping contains salt so if you're sensitive to sodium, feel free to decrease the amount of topping you add to 1 tablespoon, and skip sprinkling it on top of the biscuits. Tasted good, but I didn't have any shortening and used butter. They did not rise correctly. 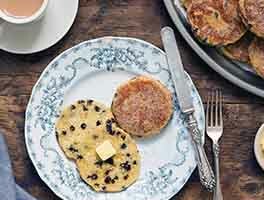 Is using the butter the reason for them failing to rise? Big hit with the family. The everything mixed in makes all the difference. 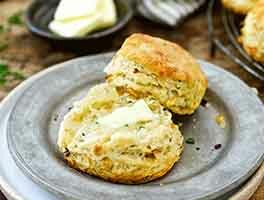 This is my favorite biscuit recipe! 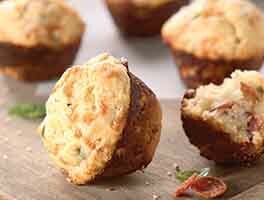 The Everything Topping Mix adds a great flavor to these tender, high-rising treats!